Jungle Wall Stickers	There are 75 products. 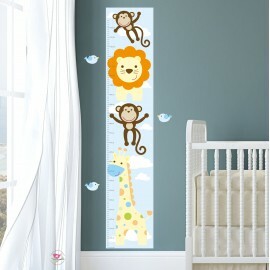 Make monitoring your little ones height fun with our Jungle Animal Growth Chart. 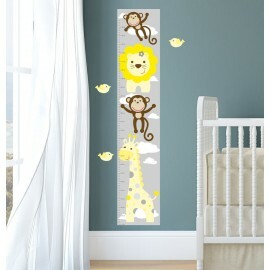 Simply peel and stick our premium self adhesive fabric jungle animal growth chart to your child's bedroom or nursery wall to brighten the room and record your childs growth in the process. 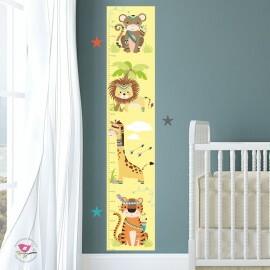 Make monitoring your little ones height fun with our funky boho tribal jungle Growth Chart. Simply peel and stick our premium self adhesive fabric tribal jungle growth chart to your child's bedroom or nursery wall to brighten their room and record your child's growth in the process. 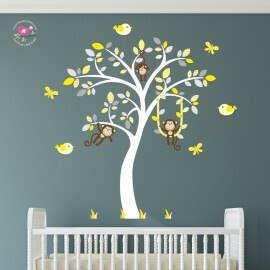 Jungle Nursery Wall Stickers Tree Scene featuring our friendly our cheeky swinging monkeys. Now available in the popular Grey and Yellow colours scheme, perfect for placing above the cot or above the skirting board. Create a magical room within hours with our quality self Adehsive Fabric Wall Stickers! Captivate your baby's imagination with our swinging Monkey Branch featuring cute sleeping and awake owls in pink, grey and white. Simply peel and stick to transform your baby nursery room within hours. 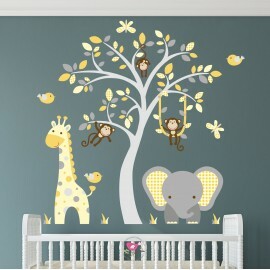 Jungle Nursery Wall Stickers Tree Scene featuring our friendly elephant and giraffe. Now available in the popular Coffee Cream and Blue colour scheme, perfect for placing above the cot or above the skirting board. Create a magical room within hours with our quality self Adehsive Fabric Wall Stickers! 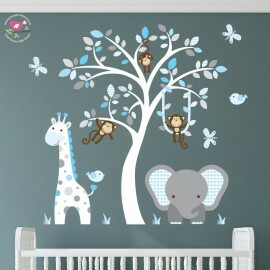 Jungle Nursery Wall Stickers Tree Scene featuring our friendly elephant and giraffe. Available in a pink, Grey and White colour scheme, perfect for placing above the cot or above the skirting board. Create a magical room within hours with our quality self Adehsive Fabric Wall Stickers! Jungle Nursery Wall Stickers Tree Scene featuring our friendly elephant and giraffe. Now available in the popular orange and grey colours scheme, perfect for placing above the cot or above the skirting board. Create a magical room within hours with our quality self Adehsive Fabric Wall Stickers! Jungle Nursery Wall Stickers Tree Scene featuring our friendly elephant and giraffe. Now available in the popular Grey, blue & white colours scheme, perfect for placing above the cot or above the skirting board. Create a magical room within hours with our quality self Adehsive Fabric Wall Stickers! Jungle Nursery Wall Stickers Tree Scene featuring our friendly elephant and giraffe. Now available in the a Blue, Yellow & Grey colour scheme, perfect for placing above the cot or above the skirting board. Create a magical room within hours with our quality self Adhesive Fabric Wall Stickers!